Valentine’s Day as a whole has never been my thing. Back when I was a single lass, Valentine’s Day made me feel sad and left out. Even when I was attached, when February 14th rolled around I was never interested in celebrating. Matt and I even used to host “anti'-Valentines” Day parties and in our 10 years together, I’m not sure we’ve ever really celebrated Valentines Day or exchanged gifts. Valentines Day feels forced and commercial, and puts unnecessary pressure on people. Now that doesn’t mean I don’t like to celebrate the people I love, I just don’t think it has to happen on February 14th with grand gestures. But…. 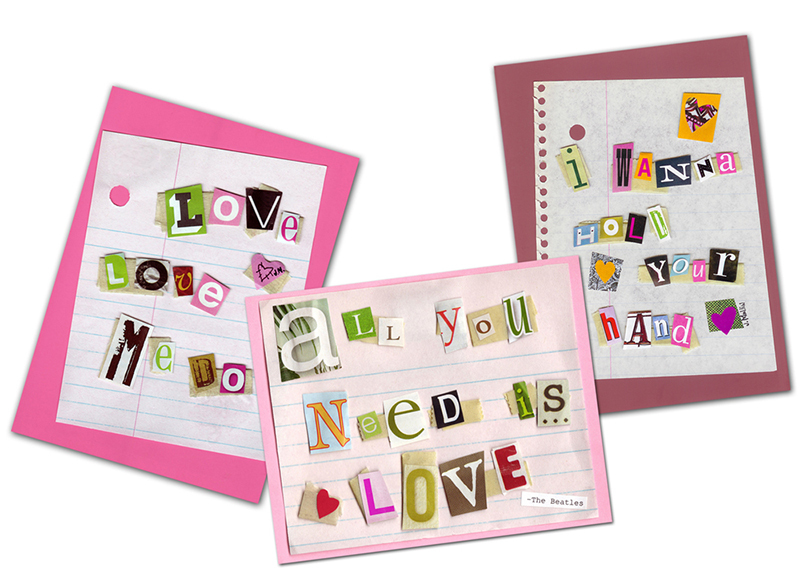 I’ve always loved making, giving, and receiving Valentines. I looked forward to decorating my shoe box for exchanging valentines at school and in my early adult years, I used to send out valentines in lieu of holiday cards. Over the years, I’ve made and sold a lot of valentines. This “Smooch” card was one of the first things I made and listed on Etsy back in 2008. My out of print “Just a Little Love Song” Beatles themed valentine collection. “Valentiny” is also no longer in print. A few years later, during my pattern phase, I made “Sending my Love to You” and “Love You Mean it.” I still really love these cards and continue to sell them online and locally. The “Better Together” card has a been a top seller for years. Click through to purchase. You all remember this phase, right? For a couple of years, I drew birds almost exclusively. (You can read about how that all started HERE.) I knew this adorable pair of fairy wrens was destined for a card and it quickly became a best seller in my card collection. You can order this cutie right HERE. The “You are Loved” card is good for any day you want to send some love out into the world. My newest valentine is just for the gals. Do you Celebrate Galentine’s Day? I just whipped up this card this past weekend. As my work mainly appeals to females, I thought it would be fun to create a “Galentine’s Day”card. Celebrated on February 13, Galentine’s Day was created by Amy Poehler's Parks and Rec character Leslie Knope. (One of my favorite shows of all time!) Basically, it's the day to celebrate your love for your best girlfriends. All of my cards are blank on the inside and are available in my web shop. Is there a sentiment you’d love to see me put on a card? Or a card for a certain occasion/event you’d like to see me add? I’d love to add some more cards to my collection and I’m always open to new ideas. Just shoot me an email or leave a comment. The creative life can be hard to navigate. Sometimes you need a little guidance or a little encouragement to keep you going. In the past few years, I've noticed a deluge of books on the subject. Working at the public library, I've had a chance to read many books about the creative life, and I thought I'd share my favorites with you. Books that have provided me encouragement along my journey as a creative. Click through for purchase details. These titles have all provided me with practical guidance on my own creative journey. (Note the word PRACTICAL.) None of these books offer pie in the sky, get famous fast solutions. Instead, think of them as creative pep-talks, each with actionable steps you can take to live your best creative life. They're NOT just for visual artists, but for anyone who has a creative pursuit. Written by the author of the smash hit "Eat, Pray, Love," this is my absolute favorite book on the list. Though Gilbert discusses her own creative process as a writer, the sage wisdom she doles out is applicable to anyone with a creative pursuit. She encourages creatives to NOT quit their day jobs. When your creative pursuit becomes a job, you've got more pressure to produce and it often takes some of the joy out of it. She also puts to rest the myth of the suffering artist. Making good art doesn't have to be torture! This is a very quick read filled with practical advice in a graphic style. Kleon purports that "Nothing is original, so embrace influence, collect ideas, and remix and re-imagine to discover your own path. Follow your interests wherever they take you. Stay smart, stay out of debt, and risk being boring—the creative you will need to make room to be wild and daring in your imagination." One of my the many humorous illustrations by Martha Rich inside "Your Inner Critic is a Big Jerk" by Danielle Krysa. After reading Danielle's blog "The Jealous Curator" for years and religiously listening to her podcast "Art for Your Ear", I was quick to purchase this book. In her humorous, light-hearted way, Danielle lays out her 10 truths about what it means to be a creative person. Cheeky illustrations by Martha Rich throughout the book bring even more levity to the discussion. Using anecdotes from successful artists and from her own life, Danielle discusses creative roadblocks, like "Imposter Syndrome," when you feel like a fraud, insecure about your art and creation process. (Boy, can I relate?) She also offers simple, practical exercises to help you get over those roadblocks and get down to the business of making good work. One of the awesome handwritten spreads inside "Show Your Work" by Austin Kleon. In this follow up to Steal Like an Artist, Kleon explains how to "Share Like an Artist." In his signature style, combining handwritten pages, illustration, and text, he lays out 10 ways to share your creativity and get discovered. This is another quick read with actionable advice to help you get your work out there. More than any of the other books on the list, Growing Gills provides a step-by-step process to help you find your creative focus. Complete with a downloadable workbook, this book is like your own private workshop, helping you build focus to finish your creative work. I've read and re-read these books. They're all that good! I tend to grab them off my shelf when I'm in an artistic slump or feeling like a fraud again. These little creative pep talks sure do help. Do tell! Leave a comment and let me know. I'm always looking for inspirational reading. One of my favorite parts of the holiday season is gift wrapping. I spend way too much time on it and I like to come up with new ways to wrap things every year. Tea towels make great gift wrap. Here I've wrapped up jars of local honey and apple butter. Since I started making tea towels a couple years back, I enjoy using them as wrapping "paper". Here I wrapped up a jar of local honey and a local apple butter and topped it off with one of my dala hoop ornaments. Wouldn't this make a cute teacher or hostess gift? Click HERE to see how I wrapped this. My fabric ornaments have sold well this year. I Introduced these small fabric hoop ornaments in 2016 and did not sell a single one. This year, they've been super popular! The ebb and flow of retail is weird. Wine towels are new in 2017. Click through to purchase. Wrap a bottle of wine in this wine tea towel and you've got an instant holiday hostess gift! All orders placed by December 19th will ship with a free mystery print. It's a little gift from me to you! December 19th is also the last day I will be shipping for the holidays. My apologies to my international crew....Any international orders placed now won't make it in time for Christmas.